Mr. Bernard Rey was born in France in 1958. He is a doctor in Veterinary medicine by training and holds a Master of Science in Economics of Development. Bernard Rey started his career in International Agricultural Research Institutions in Mexico, the Netherlands and Ethiopia. He subsequently joined the European Commission and served in the Delegations of the European Union in Nigeria, Kenya and Madagascar in charge of the EU Rural Development and Agriculture portfolios in these countries. He was the Head of Development Cooperation of the EU in Kenya between 2009 and 2012, until he was appointed in the leadership of the food security and agriculture policy department of the European Commission DG International Cooperation and Development (Brussels). 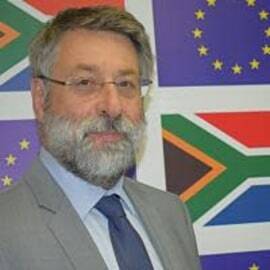 Since September 2018, he serves as Head of Cooperation of the EU in South Africa.